The brief for today’s post is colour, and my relationship with it. If you were to ask me what my favourite colour is, I would probably say some sort of shade between green and blue, or sometimes deep purple. When I was looking down my Ravelry notebook to try and see what the predominant colour on my finished objects is, it is fairly clear that blue plays a large part. Nearly all the projects have blue in them, even if only a token amount. Most of the ones that don’t have blue have either green, purple or both. The thing that surprised me about my list of finished projects is that if you look for any colour, I think you will find something, even if only a few rows. Admittedly, there are a couple of projects that help with this: my Winter Olympics project from 2010 covers many shades of yellow and orange that don’t otherwise appear. Thank you Zauberball! So, how do I feel about the predominance of blue, green and purple? Is it something I want to change, or am I happy with it? It is nice to have knitted items to match other clothes I wear. Since most of my clothes also hover round the bluey-green mark, it seems sensible to keep knitting to match them, so I’m not going to go out of my way to avoid blue and green. I have, however, taken a couple of steps towards diversifying my stash. One of the best ways of acquiring new colours to knit with is to buy yarn without knowing what colour it is. Sound strange? Not really, I’ve joined a sock club with The Knitting Goddess. The first month was a safe blue-green-purple combo, then there was brown, bronze and pink, followed by yellow, red and pale blue. I would never have chosen them, but I’m enjoying knitting socks with the yellow, red and blue. Perhaps this will inspire me to diversify in the future. A few months ago, when I last looked at the range of colours I knit with, I noticed a particular gap in the spectrum: baby pink. I have to say, I’m not a big fan of pale pink, although I’m getting used to it thanks to my small daughter and her amazing wardrobe of pink clothes. So here is one of my personal challenges for the year: to make wonderful pink socks… and wear them. Socks are a good way to start wearing bolder colours. Pink didn’t enter my life until my nieces arrived into the world. I had to knit a pram blanket in baby pink, and the experience wasn’t as bad as I thought it would be! I’m not a particular fan of pink either – but I have a wonderful pair of angora pink bedsocks from Orkney Angora! I too am in the no-pink-for-me group, though my projects and stash suggest otherwise. There are pink socks in progress here also. Great to find you through Blog Week. 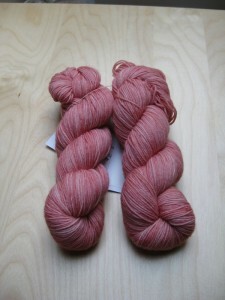 If that’s the pink you hope to use on socks, they are going to be lovely! Such a beautiful collection of hues! Socks are a great way of wearing colours I wouldn’t normally wear anywhere else – even at work! My color spot is exactly where yours is. I just love the confluence of blue and green. You’re right about the yarn club — it’s a great way to try colors you’d never look twice at in a store. Baby girls will give you a new appreciation of pink. Mine is 22 and she is still crazy about pink!